Baseball Card News by DeansCards.com: In Stock! 1962 Bubbles Inc Mars Attack Cards! 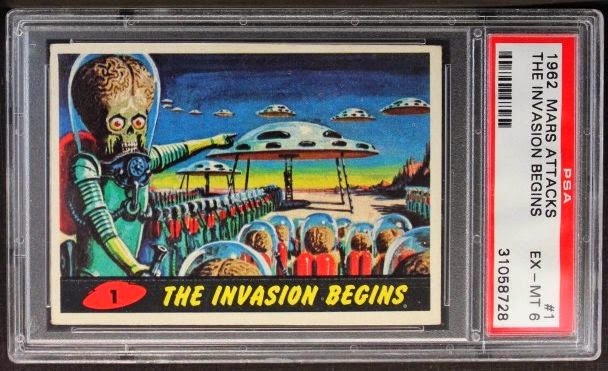 We have recently acquired a beautiful collection of 1962 Bubbles Inc. Mars Attacks cards. The grades on these cards range anywhere from Excellent to Near Mint. Wally Wood and Bob Powell were hired to draw the sketches of the images while artist Norman Saunders ( Who also did the Civil War News and Flags of the World) brought the images to life with color. The cards were distributed via vending machine, costing 5 cents for a pack of five. They initially sparked some controversy with parents because of their gory images and explicit themes. The violent depictions were not the norm for trading cards from that era. This series is particularly hard to come by because many mothers at the time threw them away due to the graphic images they presented. The first card, "The Invasion Begins" as well as the last card, which is a checklist, are the two most valuable cards in the set. These cards command a premium in higher grade.